Order your own copy of the Kethra A'laak Hero Expansion at your local retailer or online through our website today! As the Empyrean blesses all that is good and pure in magic, so the Ynfernael empowers that which is corrupt and dark. Such evil power is difficult to control, but deep in the Ru Darklands, many tribesmen of the Uthuk Y’llan offer themselves to the forces of the Ynfernael, destroying themselves in pursuit of power. But there are a select few among the accursed people who can bend this wicked magic to their will, including the witches of the Blood Coven and the most honored among their ranks, Kethra A’laak. The witch is considered to be the most ruthless of the Blood Coven, and while her loyalty is sworn to her sister, a dangerous ambition burns within her and she knows she is destined for more. Now, as the locust swarm of the Uthuk Y’llan goes to war, command over all of Terrinoth is within her reach. 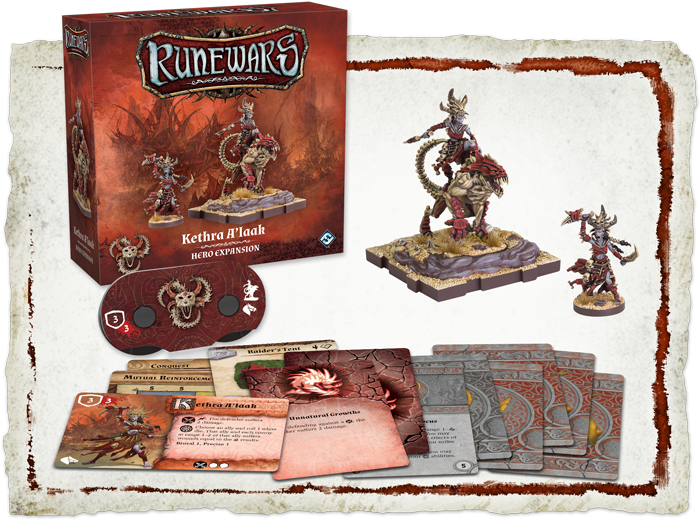 Today, we're pleased to offer you a closer look at the Kethra A’laak Hero Expansion for Runewars Miniatures Game, available for pre-order now at your local retailer or online through our website! Kethra A’laak dreams of conquest and glory, desiring power beyond even what her status in the coven can provide. She is prepared to strike down any who stand against her, even if the whole of Mennara set itself in her path. When she is participating in a melee, Kethra A’laak rolls two white dice, a power only matched in force and consistency by Waiqar the Undying’s loyal soldier Ardus Ix’Erebus. This, combined with her Brutal 1 and Precise 1 keywords, is sure to spread fear in the hearts of any who must face her on the battlefield. But Kethra A’laak’s true power comes from the magic she is able to imbue into her allies before the battle even begins. Beyond the sheer force of the sorceress herself, the Kethra A’laak Hero Expansion adds a new layer of savagery to your strategy by introducing a new condition to Runewars Miniatures Game. After the deployment stage of setup, Kethra can use her Twist Bone ability to imbue any of her Uthuk allies with her dark magic, causing Unnatural Growths to erupt from their skins. 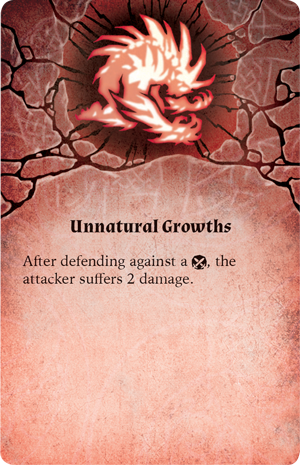 These razor-sharp spines turn a warrior’s very body into a weapon, dealing two damage to any who attack them in a melee. This ability mirrors Kethra’s own melee ability, but without the need to spend a surge. After all, Kethra still thinks of herself as a leader within the army of the Uthuk Y’llan, meaning she is at her strongest when those who rely on her are free to wreak as much havoc as possible. The Kethra A’laak Hero Expansion includes two beautiful yet monstrous figures; one of Kethra alone and one of her astride her bonded Flesh Ripper, Hurokk, whom she summoned early in her mystic teachings by offering the souls of her rivals to the Ynfernael, along with her pledge of service to the demonic powers. 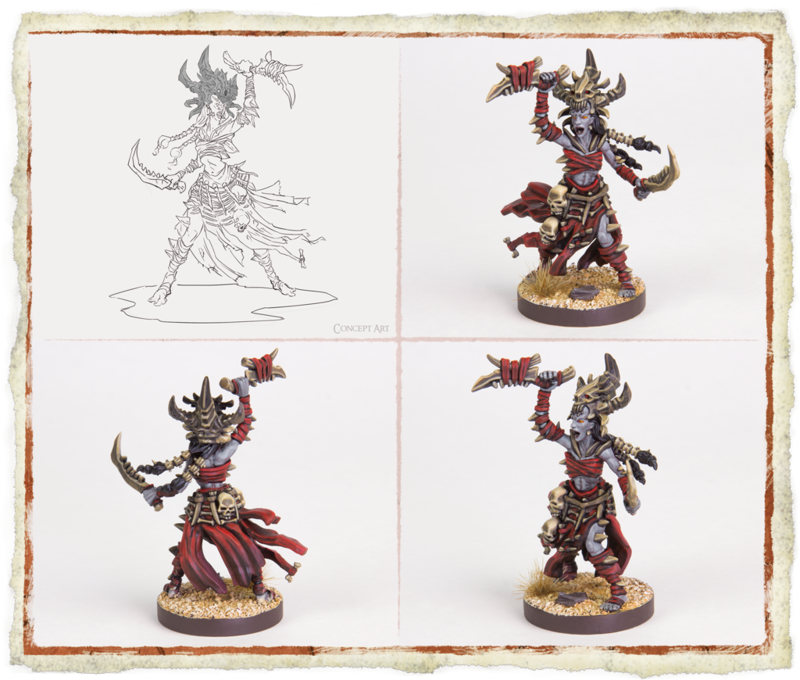 In addition to the sorceress herself, this expansion also offers you one new terrain piece, a new objective and deployment card, two condition cards, a collection of tokens, and six upgrade cards to elevate the power of your Uthuk army. 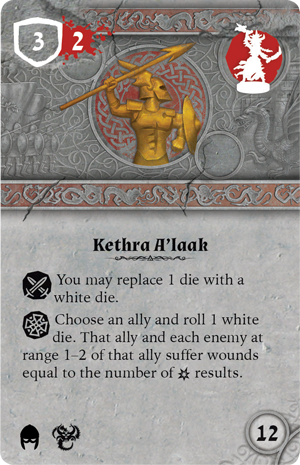 When you send Kethra A'laak into the heart of your locust swarm, using her as a figure upgrade in your Uthuk infantry, you can replace any one of your unit’s dice with a white die during a melee. Then, she still has access to the skill action detailed on her unit card, using the blood of her allies to cast dark magic that damages any enemy who comes too close. Otherwise, you may simply choose to deploy the wandering witch as her own unit, fortifying her to stand against even the strongest soldiers of the Daqan. 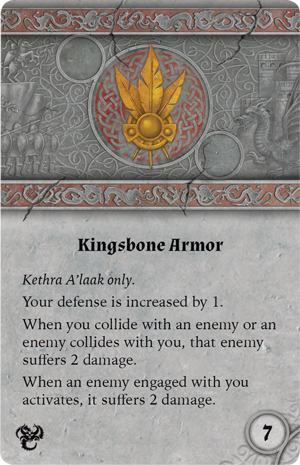 When Kethra A’laak wears her Kingsbone Armor, which increases her defense by one, her enemy suffers two damage any time that she collides with the rival force. 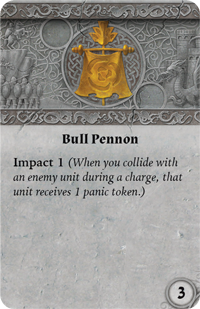 Unlike the player-favorite Bull Pennon upgrade, this damage occurs regardless of whether the sorceress is the one impacting another unit or the one being collided with. 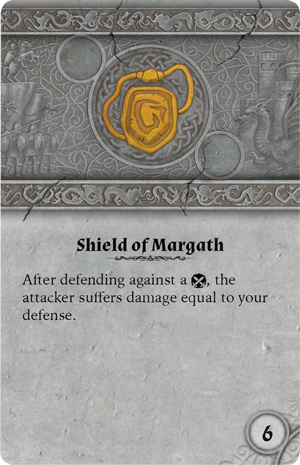 If you combine this upgrade with the Shield of Margath, a copy of which is also included in this expansion, you can turn your blood sorceress into a one-woman war machine, tearing through your enemy’s ranks and sacrificing their bodies to the Ynfernael to increase her own standing in the dark forces’ favor. As the army of the Uthuk Y’llan sets its sights on Terrinoth, Kethra A’laak’s eyes are on the throne. For now, she plays the role of an obedient, if willful, sister of the Blood Coven, but Kethra knows her time will soon come. She shall settle for nothing less than absolute rule, and if she rules over a land of ash and smoke, so be it. 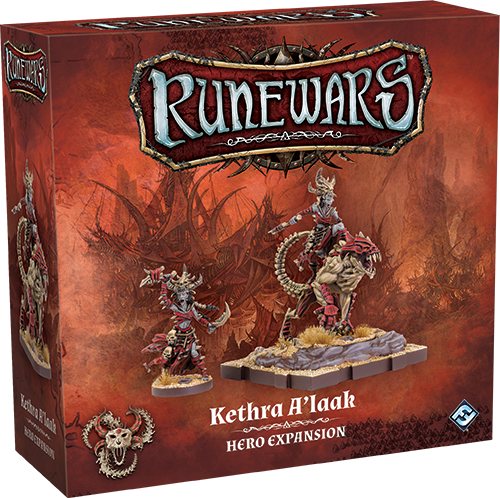 Pre-order your copy of the Kethra A’laak Hero Expansion (RWM29) at your local retailer today or on the Fantasy Flight Games website here!